The role of hypoxic conditions in physiological and disease-related developments is more and more investigated nowadays. While hypoxia pathway-specific PCR arrays are available as catalogue references, researchers involved in protein analysis do not have access to such ready-to-use antibody-based catalogue arrays. Antibody panel (sampler) Kits or trial size antibodies are highly useful solutions to further investigate cell signaling pathways at protein level while keeping control at experimental expenses. 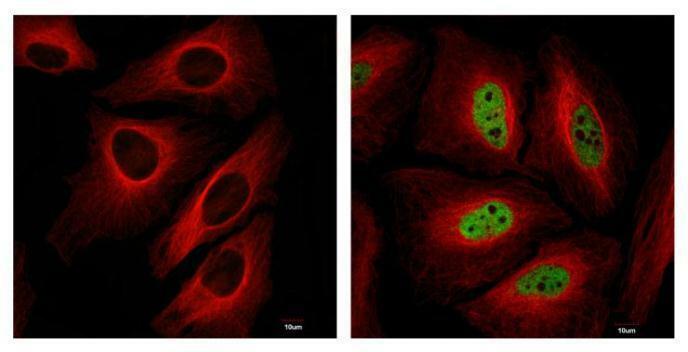 HIF1 alpha antibody detects HIF1 alpha protein at nucleus in CoCl2-treated samples (right panel) by confocal immunofluorescent analysis (left panel = untreated). Antibody panel (also called sampler) kits contain a selection of antibodies focused on a dedicated pathway. These kits also come with a conjugated secondary antibody to conveniently run immuno-assay experiments (mostly Western blot protocol). Such antibody kits bring researchers more flexibility to validate an experimental hypothesis, to find a biomarker of interest, or to test a series of pathway-specific antibodies according to their samples and their experimental conditions, at lower costs. Regarding Hypoxia, GeneTex has recently released a panel kit with 6 different primary antibodies guaranteed for the detection of Heme Oxygenase-1 (HMOX-1), TWIST, ARD1A, NFkB p105/p50, Hypoxia Inducible Factors (HIF)-1 alpha and HIF-2 alpha (Hypoxia Pathway Antibody Panel kit GTX300061). These 6 protein targets are either active, up-regulated or interact with HIF-1 alpha while hypoxia is induced. For researchers seeking to analyse other hypoxia-related protein targets at very moderate costs, antibody suppliers have launched trial size formats. Researchers can access small amounts (25 µl samples for GeneTex and Rockland Immunochemicals Inc.) of hundreds of high quality monoclonal or polyclonal antibodies. Hypoxia experts can pick up trial sizes of antibodies specific for their marker of interest (ex. Carbonic Anhydrase IX (CAIX), Calveolin I (CAVI), EGLN2, von Hippel-Lindau tumor suppressor (VHL) (2), HIF3 alpha ...). (1) Kucharzewska P. et al. “Exosomes reflect the hypoxic status of glioma cells and mediate hypoxia-dependent activation of vascular cells during tumor development” (2013) PNAS. 110(18): 7312-7317. Br J Pharmacol. 168(4): 920-931. This publication describes the use of the anti-VHL from GeneTex (cat. nr GTX101087). The use of arrays in proteomics are more and more popular. This is the case for cytokine expression analysis for a few years now, and is true today for signal transduction studies (165 protein targets analysed at once with Full Moon Biosystems’ arrays). Pathway specific arrays are even now available (with robust protocols) as catalogue references for phoshorylation studies (ex.138 and 137 markers per slide for the mTOR and AKT Pathway Phospho Antibody Array respectively). No doubt that Hypoxia pathway antibody arrays will be available soon. Want to benefit from these attractive solutions? Antibody sampler (panel) kits and antibody trial sizes are attractive alternatives for researchers looking for small amount of antibodies to validate or analyse only a few number of markers in their experimental models. In addition to a large choice of references (specific for one protein target or several targets gathered in one thematic sampler kit), these immuno-assay tools are very affordable. Finally, these antibodies are high quality and are 100% guaranteed for various applications including Western blot. Looking for a Western blot protocol? Find a recently edited, robust WB protocol designed by tebu-bio’s antibody users for researchers.